Synthetic peptide within Human Aquaporin 5 aa 250-350. The exact sequence is proprietary. IHC-P: Human colon, lung and stomach tissue. WB: Fetal lung lysate. SW480 cell lysate. Flow Cyt: SW480 cells. Our Abpromise guarantee covers the use of ab92320 in the following tested applications. WB 1/1000 - 1/10000. Predicted molecular weight: 28 kDa.Can be blocked with Aquaporin 5 peptide (ab214008). IHC-P 1/100 - 1/250. Antigen retrieval is recommended before commencing with IHC staining protocol. The use of an HRP/AP polymerized secondary antibody is recommended as stronger signals have been found using these. Forms a water-specific channel. Implicated in the generation of saliva, tears, and pulmonary secretions. Required for TRPV4 activation by hypotonicity (PubMed:16571723). Together with TRPV4, controls regulatory volume decrease in salivary epithelial cells (PubMed:16571723). 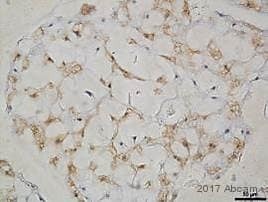 Immunohistochemistry (Formalin/PFA-fixed paraffin-embedded sections) - Anti-Aquaporin 5 antibody [EPR3747] (ab92320)Yin et al PLoS Genet. 2015 May 15;11(5):e1005242. doi: 10.1371/journal.pgen.1005242. eCollection 2015 May. Fig 6. Comparison of non-diseased human lung (left panel) and Type I PPB (right panel). 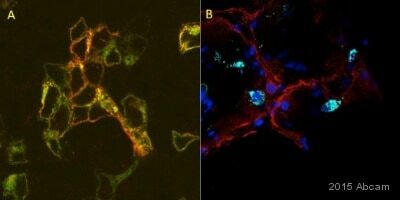 Immunostaining for the distal lung Type I pneumocyte marker Aquaporin 5 using ab92320. 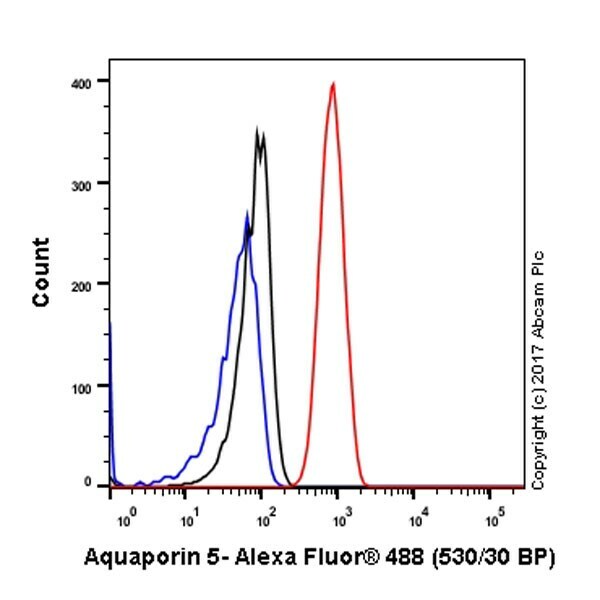 Aquaorin 5 was expressed in distal alveoli of non-diseased lung tissue and in Type I PPB associated epithelium. The human Type I Pleuropulmonary Blastoma tissue samples, formalin fixed and paraffin embedded, were obtained through the genetic studies tissue bank of the International PPB registry. Immunocytochemistry/ Immunofluorescence - Anti-Aquaporin 5 antibody [EPR3747] (ab92320)Klaka et al PLoS One. 2017 Aug 10;12(8):e0182752. doi: 10.1371/journal.pone.0182752. eCollection 2017. Fig 4. In vitro characterization of key marker proteins AQP5, ANO1, α-SMA, and CEACAM5 in cultures of the SG (sweat glands) by immunofluorescence staining. Panel b shown: Stained secretory coil (sc) and duct (du) sections of native human sweat glands were analyzed in axillary skin tissue (a,d,g,j) compared to in situ glands (dashed lines) with outgrowing cells in 2D cultures (b,e,h,k) and 3D models (c,f,i,l). Polarization and differentiation of spheroids could be shown with luminal ANO1 (f) and basolateral α-SMA staining (i). 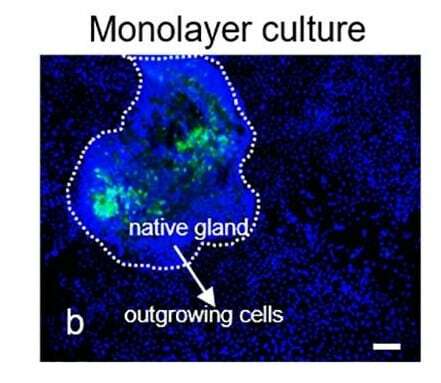 Outgrown SG cells showed decreased marker expressions in the 2D cultures. 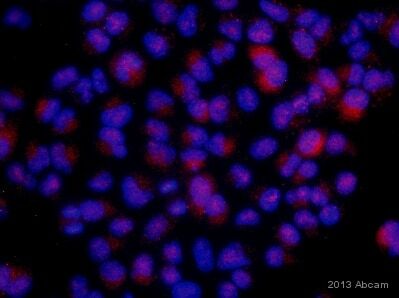 Nuclei stained with DAPI. ab92320 showing positive staining in human colon tissue. ab92320 showing positive staining in human stomach tissue. 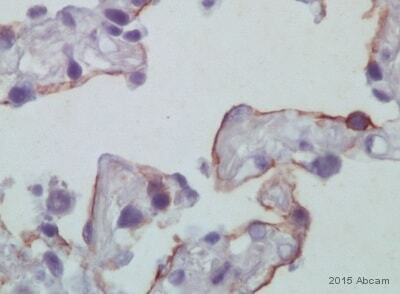 ab92320 at 1/100 dilution, staining Aquaporin 5 in paraffin embedded human lung tissue. 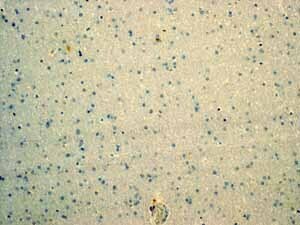 ab92320 showing negative staining in human brain tissue. Flow cytometry analysis of SW480 (Human colorectal adenocarcinoma cell line) cells labeling with unpurified ab92320 at 1/200 dilution (1 µg/ml) (Red). Cells were fixed with 4% paraformaldehyde and permeabilized with 90% methanol. 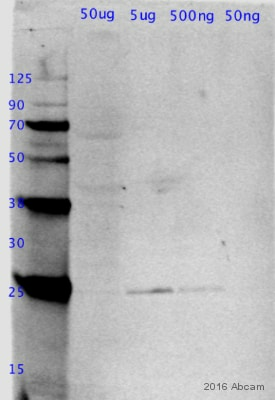 Goat anti rabbit IgG Alexa Fluor® 488(ab150077) at a 1/2000 dilution, was used as the secondary antibody. Rabbit monoclonal IgG (Black) (ab172730) was used as a isotype control. Cells without incubation with primary antibody and secondary antibody (Blue) were used as unlabeled control. Publishing research using ab92320? Please let us know so that we can cite the reference in this datasheet.